Winter brings additional challenges to the mountain environment. Snow, ice and extremes of weather can dramatically increase the danger for the winter mountaineer, but for those who wish to face these challenges when winter walking, the experience can be fantastic. Get together with friends and book one of our Winter Mountain Leaders to guide or train you or join an 'open' course on a set date. We have Winter Mountain Leaders available for bookings in the following areas throughout the winter. 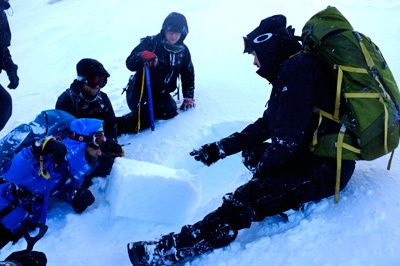 To book a Winter Mountain Leader for a private winter skills course or for a guided winter walk it costs £150 + £25 per person per day for up to 6 people. Overnight expeditions will cost a bit more. If you want to set a location and date and then ask us to publicise your days walk on our 'winter email list' then just let us know. If you would like to join this list to be notified when we are going out over winter at short notice then you can do at the top of the page. On the first two days of the course there is a heavy empahasis on learning the skills and the third day is where we put it all together on a day walk. The benefits of day 3 cannot be understated as this is where everything learnt on the previous two days consolidates. 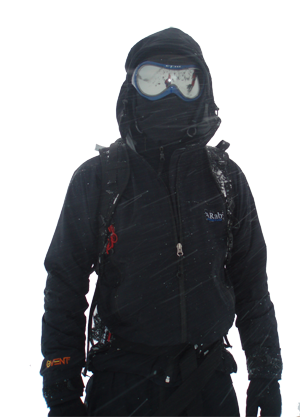 The aim of this course is to train you in the skills needed to operate as a winter walker in the British Isles. 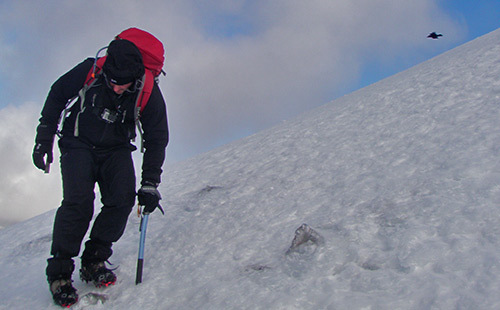 You will learn how to use an ice axe, crampons and winter boots to their full as well a covering weather, snowpack, avalanche avoidance and route planning on a daily basis.No previous winter walking or winter mountaineering experience is necessary to attend this course. The course starts each morning interpreting weather and avalanche forecasts before setting out. 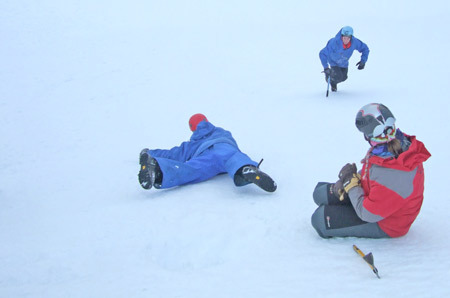 On the hill the course moves from teaching the basics of using an ice axe and crampons to learning to arrest a slip or slide safely. Avalanche awareness and snowpack analysis is an underpinning theme throughout together with navigation and route choice. The exact syllabus will vary depending on weather conditions and what you are most keen to learn. Avalanche and snow pack analysis. Courses will run with qualified Winter Mountain Leaders with a maximum ratio of 1:6 so that you can gain the most from the experience. Courses will be run with a minimum of 2 participants. Please take a look at the winter kit list. If you need to borrow anything then just ask and we will bring it along. We may not have suitable boots your size, if we don't then we can advise you on where you can hire them.